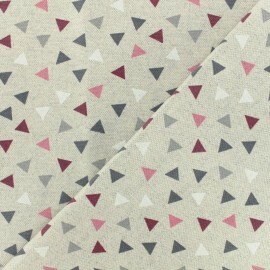 Fall for this Pyramids polycotton fabric with very nice graphic patterns of triangles, on a slightly textured linen grey background and create pouches, cushions, curtains and accessories. We adopt this original fabric slightly textured with its trendy patterns. 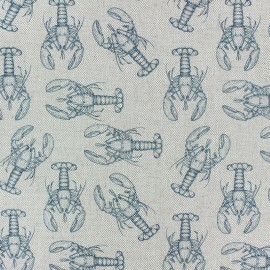 Fall for this pretty Lobster polycotton fabric, with grey lobsters patterns on a linen aspect background. 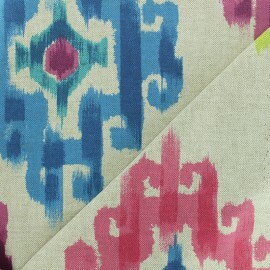 We adopt this trendy fabric for cushions, curtains and accessories, for a seaside decoration style. 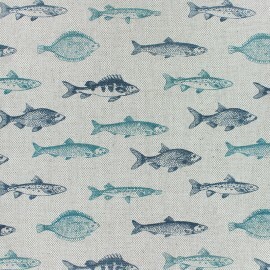 Fall for this pretty Salmon & co polycotton fabric, with blue and green fishes patterns on a linen aspect background. We adopt this trendy fabric for cushions, curtains and accessories, for a seaside decoration style. 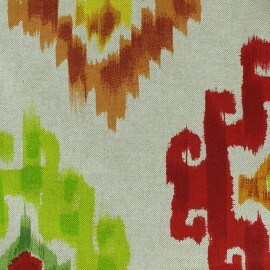 Fall for this Oeko-tex certified, 100% cotton coated cretonne fabric. 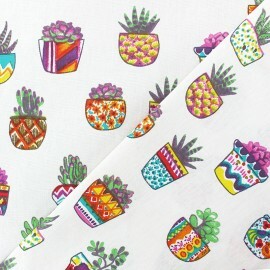 Flexible and easy to sew, this Succulents fabric with irresistible patterns of tiny plants in colorful pots, with a Mexican style, on a raw background will suit to all your desires for clothing or decoration creations. 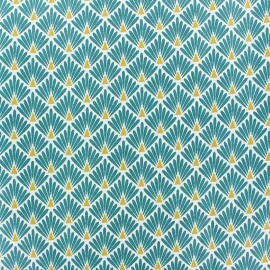 Fall for this Oeko-tex certified, 100% cotton cretonne fabric. 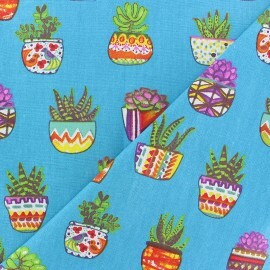 Flexible and easy to sew, this Succulents fabric with irresistible patterns of tiny plants in colorful pots, with a Mexican style, on a blue background will suit to all your desires for clothing or decoration creations. 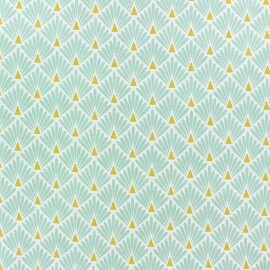 Fall for this Oeko-tex certified, 100% cotton cretonne fabric. 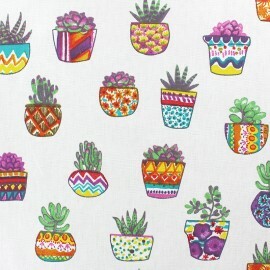 Flexible and easy to sew, this Succulents fabric with irresistible patterns of tiny plants in colorful pots, with a Mexican style, on a raw background will suit to all your desires for clothing or decoration creations. 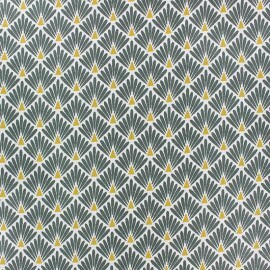 Fall for this Oeko-tex certified, 100% cotton cretonne fabric. 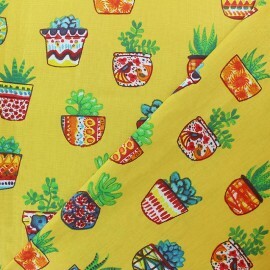 Flexible and easy to sew, this Succulents fabric with irresistible patterns of tiny plants in colorful pots, with a Mexican style, on a yellow background will suit to all your desires for clothing or decoration creations. 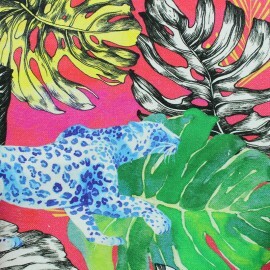 Fall for this colorful and graphic 100% cotton coated cretonne fabric. 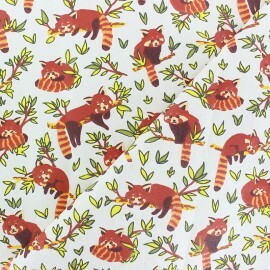 Flexible and easy to sew, this Red Panda fabric with irresistible patterns of red pandas in the forest on an off-white background will suit to all your desires for clothing or decoration creations. 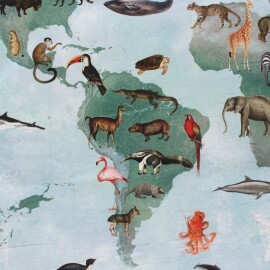 Fall for this colorful and graphic 100% cotton, coated cretonne fabric. 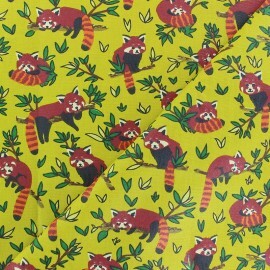 Flexible and easy to sew, this Red Panda fabric with irresistible patterns of red pandas in the forest on a yellow background will suit to all your desires for clothing or decoration creations. Fall for this colorful and graphic 100% cotton, coated cretonne fabric. 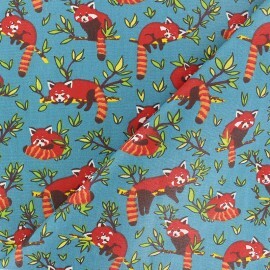 Flexible and easy to sew, this Red Panda fabric with irresistible patterns of red pandas in the forest on a blue background will suit to all your desires for accessories or decoration creations. Discover this Bérénice cotton percale fabric with girly pattern, very soft and silky, ideal for making bed linen or children's clothing. 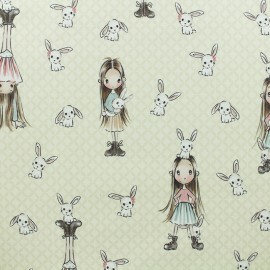 Fall for this pretty girl with tiny white bunny patterns on a pale yellow background. Discover this Bunny cotton percale fabric with kidspattern, very soft and silky, ideal for making bed linen or children's clothing. 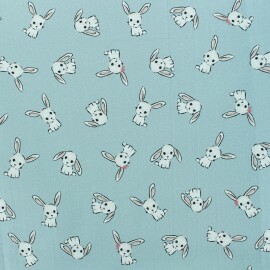 Fall for this pretty tiny white bunny patterns on a light blue background. Discover this cotton percale fabric with girly pattern, very soft and silky, ideal for making bed linen or children's clothing. 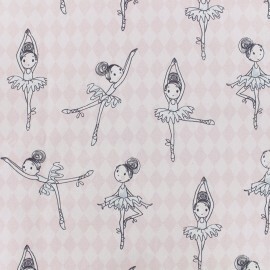 Fall for this pretty large classic dancer patterns on a light pink background. Discover this cotton percale fabric with girly pattern, very soft and silky, ideal for making bed linen or children's clothing. 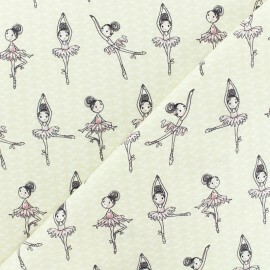 Fall for this pretty classic dancer patterns on a pale yellow background. 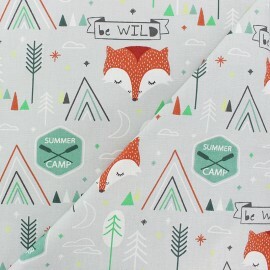 Discover this summer camp 100% cotton colorful fabric with pretty fox and forest patterns on a light grey background. Fall for this trendy and easy-to-sew fabric! Create pockets, headbands, light shirts, curtains, shorts, skirts ... and your kids will be ready for a holiday summer camp on Taho Lake ! 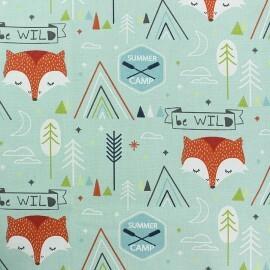 Discover this summer camp 100% cotton colorful fabric with pretty fox and forest patterns on a mint green background. Fall for this trendy and easy-to-sew fabric! Create pockets, headbands, light shirts, curtains, shorts, skirts ... and your kids will be ready for a holiday summer camp on Taho Lake ! Fall for this Grazia cotton fabric with amazing colorful flower patterns on a peacock blue background. Create pretty pouches, cushions and trendy curtains but also accessories with this original 100% cotton fabric. Fall for this white Nordic Winter cotton fabric with large geometric pattern with pastel color and holograhic details on a white background and create pouches, cushions, curtains and accessories. 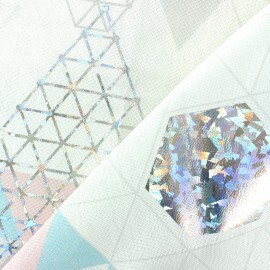 Adopt this 100% cotton, colorful fabric for a futurist decoration style. 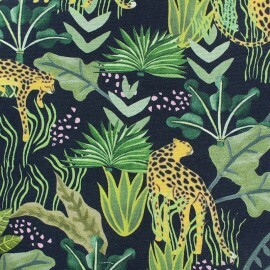 Fall for this Jungle vibes cotton fabric with amazing colorful jungle leaves and a wild blue cheetah patterns on a pink background. 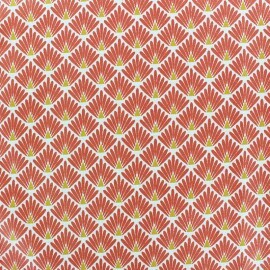 Create pretty pouches, cushions and trendy curtains but also accessories with this original 100% cotton fabric with a very soft peach skin touch. 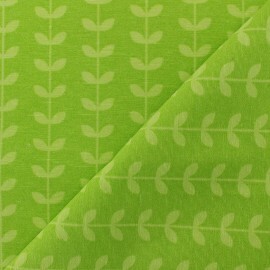 Amazing Scandi pop polycotton fabric with pretty retro scandinavian leaves pattern on a lime green background. Fall for this fabric perfect for spring time and summer and use it for your sewing project for home, bags, curtains or decorations. 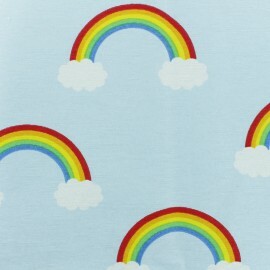 Amazing Rainbow polycotton fabric with pretty Rainbows pattern on a sky blue background. Fall for this fabric perfect for spring time and summer and use it for your sewing project for home, bags, curtains or decorations. 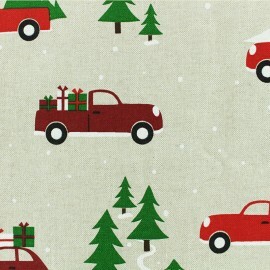 Fall for this Christmas Drive Polycotton fabric for an original Christmas table! On natural linen aspect, fall for these pretty patterns of red cars bringing their Christmas trees at home. Tablecloths, curtains, accessories and decoration for Christmas, this fabric brings modernity to the Traditional Christmas patterns! 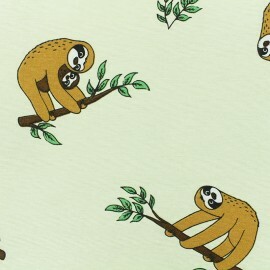 Amazing Curious Sloth polycotton fabric with pretty sloth patterns on a straw yellow background. 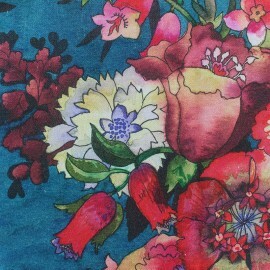 Fall for this fabric very trendy this summer and use it for your sewing project for home, bags, curtains or decorations. 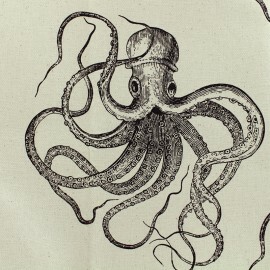 Fall for this Octopus cotton fabric with tantacular octopus pattern on a natural background and create pouches, cushions, curtains and accessories. 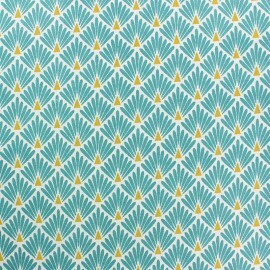 Adopt this 100% cotton fabric with ocean patterns for a perfect seaside decoration style. 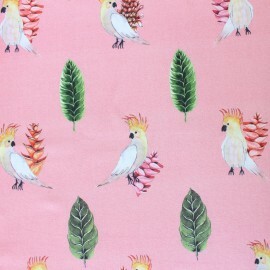 Fall for this Parrot cotton fabric with pretty cockatoo and jungle leaves patterns on a pink background. Create pretty pouches, cushions and trendy curtains but also accessories with this original 100% cotton fabric. 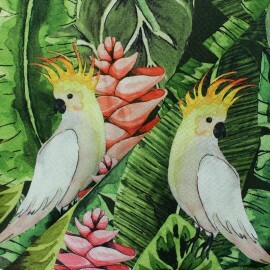 Fall for this Parrot Paradise cotton fabric with amazing jungle leaves patterns and cockatoos patterns on a green background. Create pretty pouches, cushions and trendy curtains but also accessories with this original 100% cotton fabric. 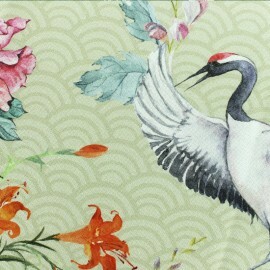 Fall for this Exotic Crane cotton fabric with very large patterns of royal cranes and peonies on a sand Japanese patterned background. Create pretty pouches, cushions and trendy curtains but also accessories with this original 100% cotton fabric. 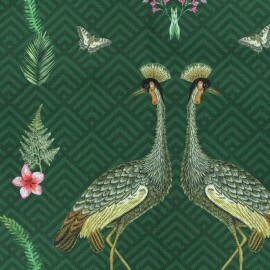 Fall for this Exotic Kingdom cotton fabric with large patterns of royal cranes and small exotic patterns of fauna and flora on a green background with tone-on-tone graphic patterns. Create pretty pouches, cushions and trendy curtains but also accessories with this original 100% cotton fabric. 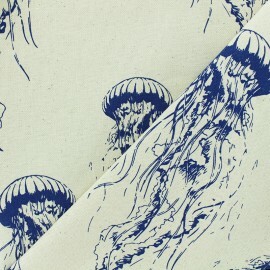 Fall for this Jellyfish cotton fabric with large blue Jellyfish pattern on a natural background and create pouches, cushions, curtains and accessories. Adopt this 100% cotton, colorful fabric with ocean patterns for a perfect seaside decoration style. 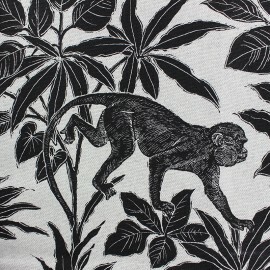 Fall for this palm grove cotton fabric with large palm trees and exotic landscapes pattern with a charcoal drawing style and create pouches, cushions, curtains and accessories. 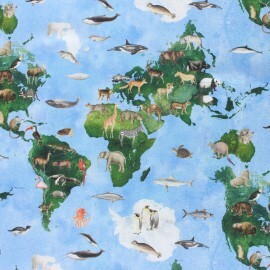 Adopt this 100% cotton, colorful fabric with exotic patterns to make your own decoration style. 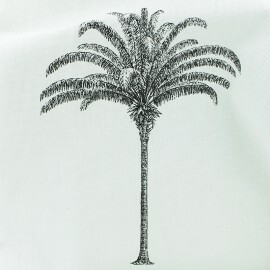 Fall for this Botanic palm tree cotton fabric with large palm trees pattern drawing in black on a raw background and create pouches, cushions, curtains and accessories. 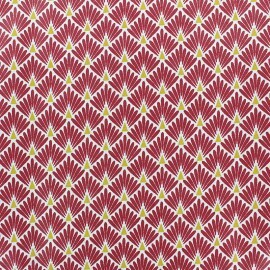 Adopt this 100% cotton, colorful fabric with vegetal patterns to make your own decoration style. 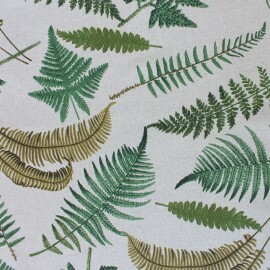 Fall for this Botanic Fern polycotton fabric with large leaves and ferns pattern on a natural background and create pouches, cushions, curtains and accessories. Adopt this colorful fabric with vegetal patterns to make your own decoration style. Our upholstery, cotton fabric is versatile and timeless. Supple and easy to sew, this fabric comes in different weight. Thus, you will find lightweight fabric and heavyweight fabric in order to best suit your sewing project. 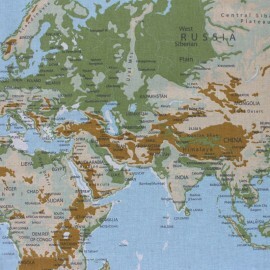 Among our selection of linen fabric, polyester canvas textiles, twill, satin, burlap, silk, fleece, organza, quilting, faux leather, cork, washed linen, foam, quilted fabrics, blackout fabrics, faux suede, flannel, dupioni, taffeta and velvet upholstery fabric, our cotton-cloth fabric is cheap and 100% woven cotton. Ma Petite Mercerie is the best place to shop for wonderful furnishing fabrics such as faux leather, online. 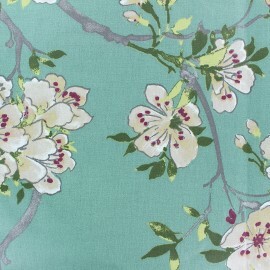 Purchase your fabric by the yard and get great deals in our clearance fabric section. We offer a huge range of high-quality synthetic yarns and threads cotton fabric! You will, for sure, fell in love with our novelty stripes pattern, pink graphic designs, multicolor graphic design, food printed cotton fabric and extra width cotton cloth. We offer a wide range of colors from taupe, lilac, navy, aqua, to fuchsia! Our home decor cotton fabric is soft and breathes. Also, if you are afraid to buy via internet, feel free to ask for fabric remnant prior to ordering your cotton-cloth fabric. 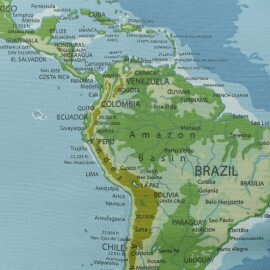 Then if you wish to order by the yard, by the meter or by 10cm, you will receive the ordered amount in one large piece. Our cotton fabric textile fiber is easy to handle! Perfect for quilting, our cotton-cloth can be used as an outdoor weave fabric. First, you can make a Scandinavian sofa with our Sven cotton fabric or our Saki cotton fabric. Also, for kids’ room, we advise you use our organic cotton or Oeko-Tex certified fabric with cute fish designs, or rainbow prints, and add ribbon or fringes. Then, conceive wonderful chairs with cotton fabrics for furnishing. Help yourself with our nice upholstery supplies selection. In addition, you can create a rug with stars pattern or polka dots. Our cotton cloth selection makes a wonderful curtain fabric and drapery fabrics. 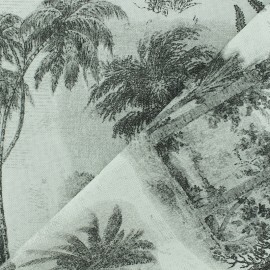 Add a tropical element to your room thanks to our Nassau cotton fabric and imagine unique cotton curtains. With sewing notion, you can use embroidery 100 cotton threads and design embroidered floral pattern on your cotton drapery. Plus, our cotton garment is versatile. Thus, reupholster sofas, bedding, daybeds, bamboo lounge chairs, resistant accent tables, sleepers, cabinets, ottomans or plaids. Finally, you can mix and match our different types of fabrics: denim, dyed cotton, muslin, voile, gingham, corduroy, fleece, sateen, nylon or batik! For instance, stitch a cushion with Minky fabric, velvet, and cotton cloth home decor fabric.